The App Store is teeming with apps for shutterbugs, and filtering through all of them can be harder than capturing a clear photo of Bigfoot. 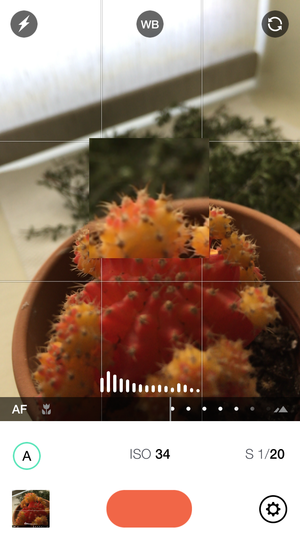 So we put the best, most buzzed-about camera apps to the test. Not only is the iPhone one of the most popular point-and-shoots on the market, if you had to pick one feature that sets it apart from its smartphone competitors, it would have to be the camera. The secret is in Apple’s proprietary image signal processor, which handles things like autofocus, face detection, and noise reduction to reduce the strain on the main processor and optimize the camera for iOS. But while the iPhone takes exceptional pictures right out of the box, Apple’s Camera app only scratches the surface of what its 8-megapixel sensor can actually do. 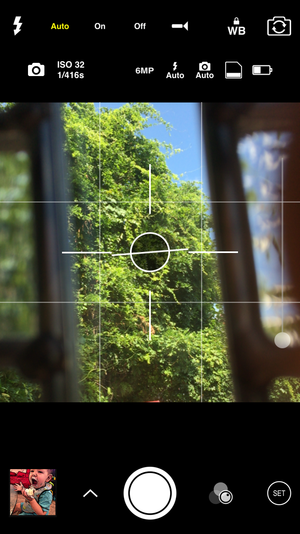 Through a set of powerful APIs, Apple has given developers far more control over the camera than it offers in its own app. Access to professional-caliber controls like shutter speed, ISO, and white balance have brought out the very best in Apple’s innovative iSight camera, elevating it beyond the expectations of a humble smartphone. So naturally, the App Store is teeming with apps for shutterbugs, and filtering through all of them can be harder than capturing a clear photo of Bigfoot. 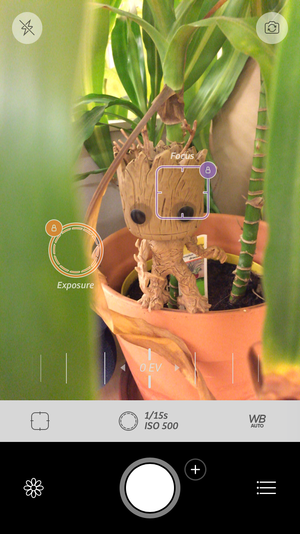 That’s why we put some of the best and most buzzed about camera apps to the test. I snapped tons of pictures and tweaked more settings than I ever have before, and the apps that performed best were the ones that let me shoot most consistently. They offer a robust set of features that let me adjust light and focus without sacrificing Camera’s greatest strength: The ability to quickly capture a moment. Ultimately, this list was made based on three factors: Interface, ease of use, and of course features. And while we can all surely all agree that every app on this list will help you take stunning photos, don’t take it personally if your favorite didn’t make the cut. (Truth be told, the app the I used most before writing this barely gets a mention.) Camera apps are some of the most subjective around, so if I’ve overlooked a great one, let me know in the comments. Debuting alongside the iPhone 4 some five years ago, Camera+ ($3) quickly became the go-to Camera replacement and set the standard for shooters, bringing things like image stabilization and exposure control long before Apple did. But it hasn’t rested on its laurels. Currently in its sixth iteration, Camera+ is continuously the best in its class, with a tremendous set of features, fantastic editing, and a blissfully customizable interface that lets you choose exactly how much control you want over the camera. 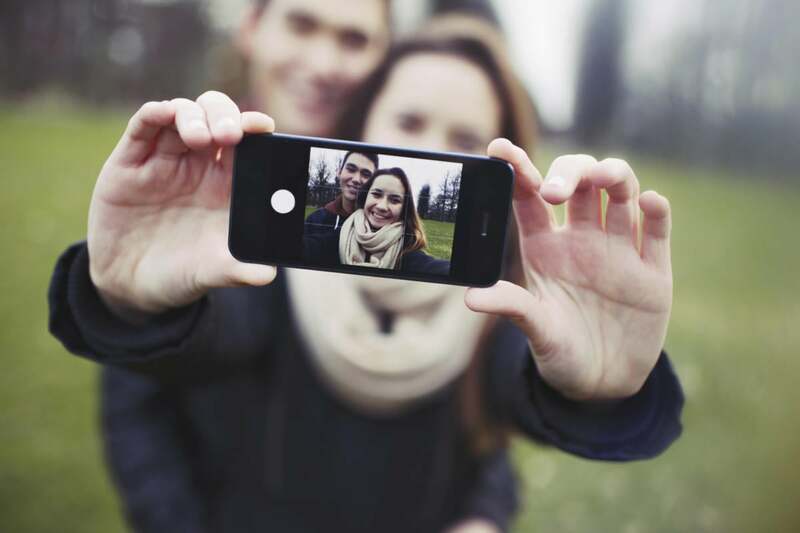 Whether you’re photographing people, trees, or tree people, Camera+ will help you capture just the perfect shot. 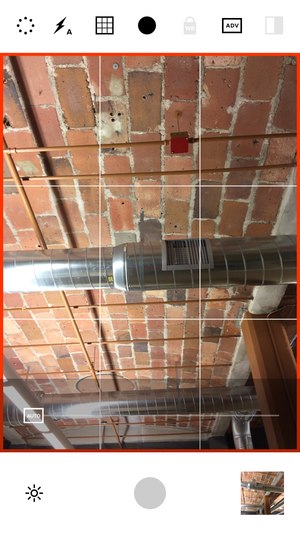 Camera+ has followed Apple’s lead when it comes to interface, making it feel familiar while cutting down on the amount of fumbling you’ll need to do to snap a quick pic. It looks extremely basic—you’ll see the familiar circular shutter button, a toggle for the flash, and the option to flip cameras—but Camera+ showcases its strength in extremely subtle ways. You’ll see the ISO, f-stop, and white balance displayed prominently, but the adjustment bars are neatly hidden behind slide-up menus, keeping the shooting area nice and clean while still letting you quickly bump up the ISO or adjust for a dark room. 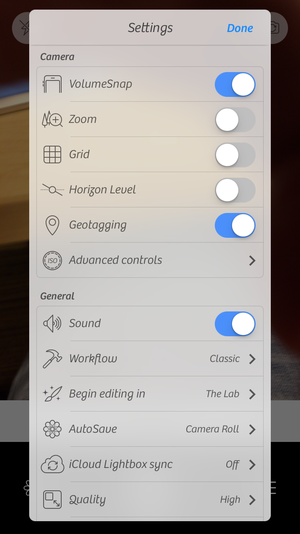 The shutter button is flanked by shortcuts to the in-app editing room and its bountiful settings. Inside, you’ll find tons of toggles that affect your shooting, view settings, and workflow, from how your photos are taken to where they’re saved. It’ll take some time to dig through all of them, but once you get it to your liking you’ll have a veritable dream shooting machine at your fingertips. The settings in Camera+ alone are worth a thousand words. 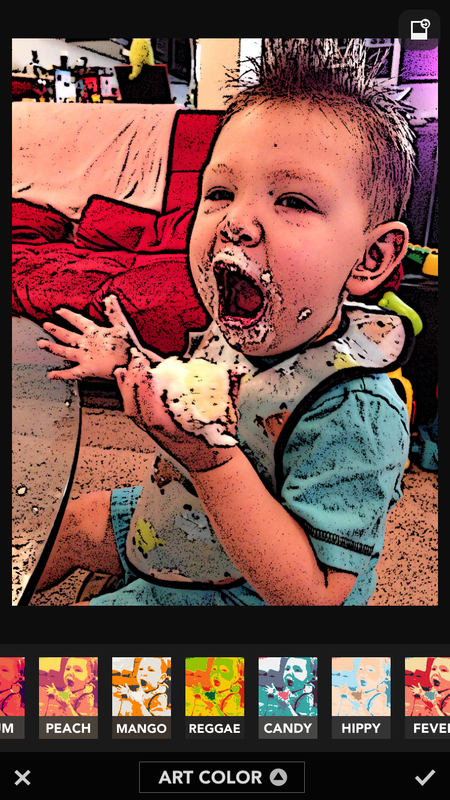 Camera+ also offers a top-notch editing environment, with dozens of filters, crops, tints, and frames to perfect your masterpiece. It has a customizable Notification Center widget for quick photos, selfies, and pro tips, and an Apple Watch companion that works as a remote, like Apple’s Camera does (though live previews will have to wait until watchOS 2). But what gives Camera+ an edge over its competitors is its tremendous versatility and intuitiveness. Whether you’re into funky filters or exact exposure, you’ll be hard-pressed to find a camera that offers a better experience and produces such consistent results. Back before it made one of the best cameras in the business, the Visual Supply Co started out offering presets for Aperture and Lightroom that emulated the look of classic Kodak, Fuji, and Ilford prints in an effort to bridge the worlds of digital and film cameras. VSCO Cam (free) continues in that vein, offering an elegant, clean camera that puts a heavy focus on classic creativity and inspiration. It’s this respect for photography that makes VSCO a standout, from the carefully crafted interface that gives photographers full control without cluttering the viewing area to its excellent array of filters that tastefully tweak your pictures with professional presets. VSCO Cam might look minimal, but it maximizes the power and potential of the camera. 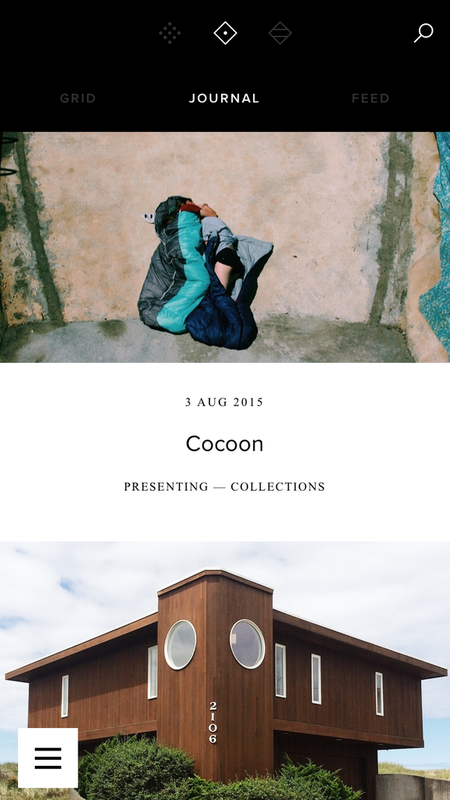 As a camera, VSCO’s extraordinarily minimal interface has a somewhat longer learning curve than Camera+. It certainly stacks up when it comes to control—you’ll be able to manually adjust white balance, exposure compensation, focus, shutter speed, and ISO—but figuring out how to properly use it requires a good deal of exploration. It’s kind of like picking up a high-end DSLR for the first time: You can make a few minor adjustments and still take an excellent photo, but you’ll be much better served by mastering its controls. But once you understand the interface, VSCO offers an unparalleled experience for photographers. It’s not just about toggles and sliders—from the precision adjustment controls to the “big-button mode” that lets you tap anywhere on the screen to snap a pic, everything is designed to help you turn what you see into a work of art worthy of Apple’s “Shot on iPhone 6” campaign. If you need a little inspiration, VSCO’s impressive community of photographers is happy to provide it. 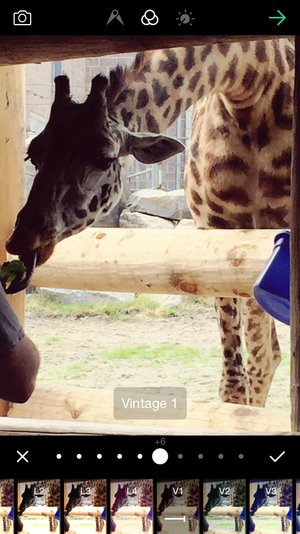 VSCO doesn’t offer the usual editing and cropping tools you’ll find in do-it-all camera apps. Rather, you can select from a dozen or so presets that do all of the fine-tuning behind the scenes. To call them filters would be underestimating their abilities. Where most apps apply a harsh overlay meant to conjure a specific style or mood, VSCO’s effects are much subtler, bringing carefully refined adjustments that enhance the elements in your photos rather than apply broad visible changes. Along with the standard library for storing images, VSCO also lets users publish their creations to a pool that can be shared and swapped with the larger community. 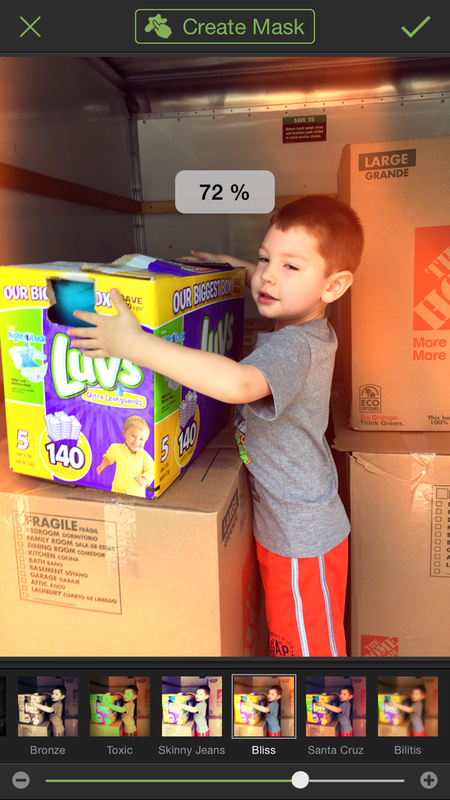 And a neat journal function lets you to your photos into Storehouse-style stories. Instagram may be responsible for the proliferation of filters in digital photography, but if it wasn’t for the iPhone they wouldn’t be nearly as popular. Now, you’ll find filters tucked into pretty much every major camera app. With TADAA’s catalogue of filters, virtually anything you shoot can be worthy of an Instagram post. But even in a bountiful sea of unique colors and textures, TADAA (free) manages to stand out. An excellent interface helps you quickly swipe to apply a live filter to your view, but head to the editing room for an array of tools and sliders to tweak the size, clarity, sharpness, and perspective of your photo. But TADAA truly shines when it comes to customization. A couple dozen filters are provided for free—many more are available as reasonably priced bundles—but there’s more packed into each one than a simple on/off switch. Each filter lets you adjust the intensity and hue, opening them up to an array of creative applications. And with smart masks that can isolate a portion of your picture, your filtered photos will look like you spent hours laboring over them in Photoshop, not seconds moving sliders on your iPhone. Making a good minimal interface is harder than it looks—especially when you’re dealing with controls and buttons that the average person doesn’t understand. But Manual ($2) manages to pull it off expertly, striking a perfect balance between too much and too little while still giving experts the tools they need to take professional photos. Don’t let its uncluttered interface fool you—Manual give you tremendous control over your snapshots. Despite its simple interface, Manual isn’t built for speed. While there is an automatic mode, the app takes full advantage of the camera’s raw power and encourages tinkering of its various settings, from the white balance and color temperature to the exposure and ISO sensitivity. There aren’t any filters or unique shooting modes—though it does provide a set of common white balance presets—but Manual packs plenty of power into its viewfinder. Adjustments are mainly made through dials and sliders, and a clever magnifying box lets you expertly shift the focus of your subject. You’ll also find a useful histogram that helps visualize any sudden exposure shifts, while a dark theme keeps light leaks at a minimum when shooting in low-light settings. But what’s most impressive about Manual is its extraordinary attention to detail, and even if it’s not your main camera, it’s definitely worth keeping in your kit. Shooting in low light can be difficult for even the highest end cameras, so it’s no surprise that it’s a common complaint with smartphones. If you’re often shooting while enshrouded in darkness, Slow Shutter Cam ($1) will give you consistently strong results. To capture photos without a proper source of light, you’ll need to slow down the shutter speed to expose the sensor to more light. Pretty much any manual camera app will let you adjust this setting, but Slow Shutter breaks it down in such a way that it’s easy to understand and control. 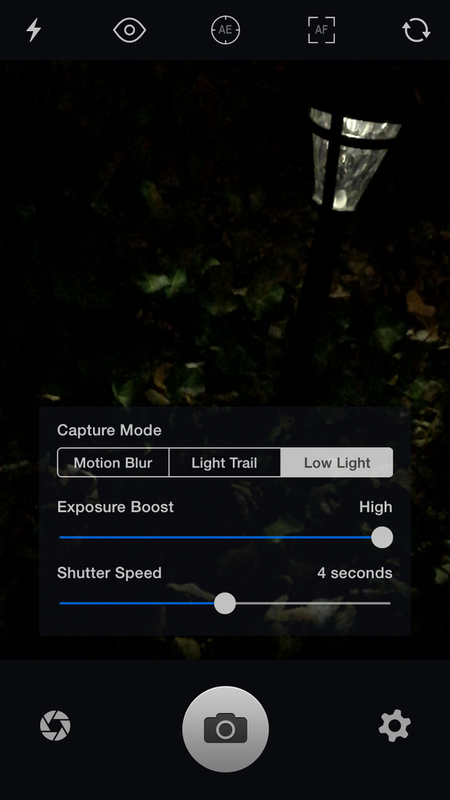 When shooting in the dark, real-time sliders for exposure boost and shutter speed will let you adjust the sensitivity to capture the desired result. It’s meant to simplify the process for amateurs, but pros will appreciate its no-fuss approach. Low-light shots are tricky with the iPhone, but Slow Shutter Cam will do everything it can to help. And it’s not just great in low-light situations. Shots that look best with long exposure—such as running rivers or zipping cars—will benefit from the motion blur and light trail modes that offer the same easy adjustment sliders, ensuring you don’t mess up a great shot fumbling with confusing controls. If you want to do more than touch up your photos or magically remove red eye, you’ll find everything you’re looking for inside Rookie Cam (free). As a camera, Rookie is fairly rudimentary, but snapping photos is only a small part of what it does. Where the other cameras in this list are mostly built to help you take the perfect shot, Rookie goes to work after the moment has been captured. Along with a standard set of editing tools, the app offers a heap of design tools to dress up your pics, from filters to badges, fonts and frames, all with the explicit purpose of transforming your snapshots into slick works of art. The app comes bundled with a nice selection of features, but a few bucks will unlock a trove of customizable goodies that will make the dullest of photos suitable for sharing. With Rookie Cam’s library of filters, you can choose to tweak or totally transform your photos. Some of Rookie’s options are admittedly amateurish, but that’s part of its appeal: Simply scrolling through the scores of stickers and shapes can put your photos in a new light and open avenues of creativity you wouldn’t otherwise discover. ProCam2 will give you a pretty good idea of what it’s like to use a DSLR—and it’ll save you hundreds of dollars. Another favorite is Shoot ($2), whose refined interface provides plenty of control without bogging you down with too many settings. It isn’t quite as minimal as Manual, but it does a fine job of striking a balance between simple and complex, with sliders, grids, and meters all working in unison to help you quickly nab a perfect shot. Even if you didn’t take the perfect shot, EyeEm’s gallery of filters will help turn it into one. The second runner-up for best overall camera (finishing just a hair behind VSCO) was ProCamera 8 ($5), a full-featured manual camera with a nice interface and a slew of manual controls. A cool feature called Exposure Swipe Control lets you regulate brightness just by moving your finger around the screen, and a series of advanced shooting modes cuts down on the amount of adjustments you’ll need to make. And if you’re a fiddler, ProCamera gives you settings aplenty. Instagram junkies will appreciate EyeEm’s (free) filter-focused camera, which features 24 adjustable screens, textures, and patterns to give your photos a unique look. And its camera isn’t too shabby either, with a minimal interface that gives you about as much control over your picture taking as Apple does. Colors ($1) offers more than 1000 filters that can easily be applied to your photos. You won’t find too many unique ones—true to its name, most of them are simple shades of color—but for a buck it’s worth keeping around just for the sheer volume of options it provides.